Google offers Free Calls to mobile phones from PC using Gmail account (A Google Account). You can make unlimited free calls to Mobile numbers located in North America and Canada. You can also make free international calls at very low cost to any cell phone in the world. Google has launched this service in 2010, then it's extended too many times and now it's still available in 2013. Hope It'll be always free. Throughout this post we will learn everything - how to dial numbers and a trick how to bring the the calling icon and installing plugin. If you are not new to Internet, then you already know Free voice calls and video calls from PC to PC using Skype. Now that's Google Plus hangouts are already introduced - you can always make free Video and voice calls using Google Talk (GTalk). To Use any Google service you just need one Gmail account. Here we'll use only Gmail service to make free call to Canada and America. If you are from China or France, then Calling rates are as low as $0.02 per minute. But our post will guide you just for free calls. Here are the requirements to make absolutely free phone calls.You must have Gmail id and Canadian or american User, if not then try our other post to make free international calls from PC to Mobile which will allow you free calling to 5 supported countries. Latest and Updated Browser (Google chrome recommended). Once you have the above requirements then you're good to go. Go To Gmail.com and login with your Username and Password. Note that you must have updated Gmail interface, if not then at the bottom of Gmail Page click on Standard View. 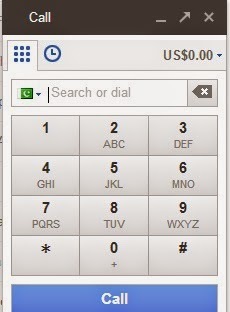 At the left side of your Gmail Homepage click on Call phone icon. Once you've clicked. then look at the left side and you'll see Gmail Dial pad. If you didn't download the Gmail Voice Plugin then it'll give you a link to download it. Now Type any US or Canadian number and then click on Call, wait for few seconds and Google will connect you to number you have dial. Free calling is limited to three hours, if the call disconnected then you can re-dial. We'll also publish more tricks to make free calls from pc to mobile.